and getting there is as easy as these three simple steps. 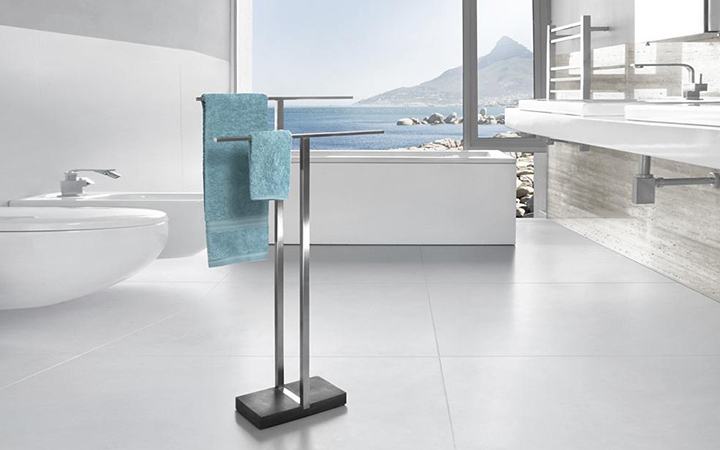 The modern bathroom is one multi-operational space, often moving from functional and utilitarian to a calming retreat within a day’s time. But bathroom lighting often goes neglected, and a poorly lit powder room can be a dim way to start each day. Considering all of the factors that go into a properly lit bath—the size of the fixtures, where they’re placed, what bulbs are used—there are quite a few things to tweak and perfect. 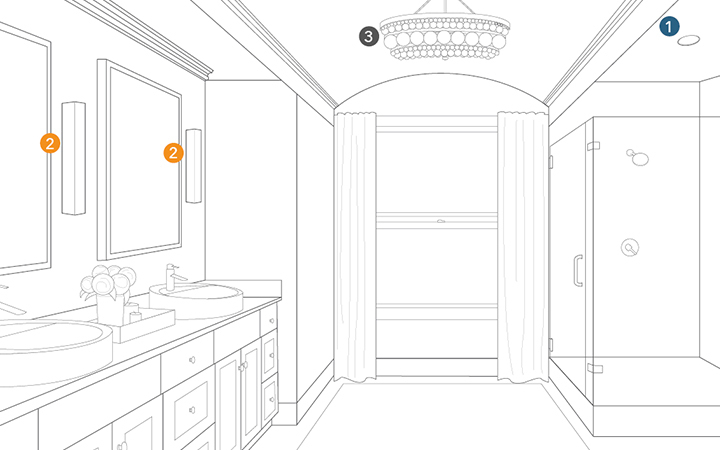 Here are our top 3 tips for getting bathroom vanity lighting juuust right. General ceiling lights in the bathroom will suffice for ambient light, but aren’t ideal for beauty and grooming tasks. In fact, lighting from above can create shadows, splotches and lines across your face while shaving, putting on makeup, flossing, etc. A bath bar, vanity light or pair of vertical sconces placed on each side of the mirror will provide the best lighting for detailed tasks. 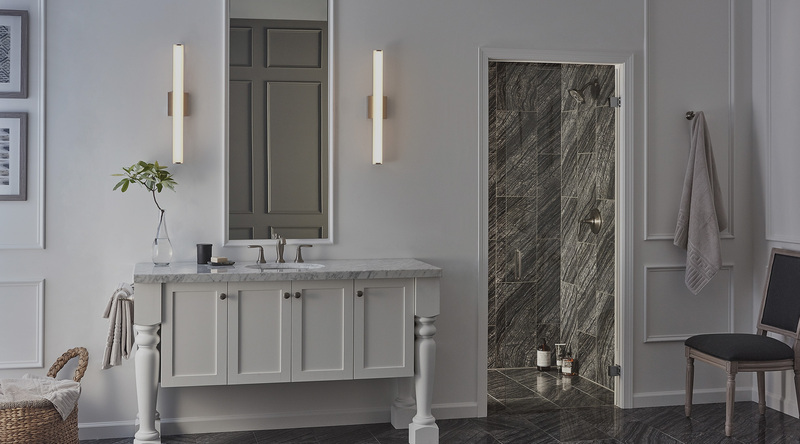 For vanity lighting on the sides of a mirror, mount the fixtures at least 28 inches apart and around 60 inches off of the floor to ensure the brightest parts of the lights are in line with your face. For a light above the mirror, mount it about 78 inches off of the floor. There’s nothing quite like natural light, right? The true color of our face, hair, makeup and clothes is best represented in the daylight, so this is the quality of light you’ll want to mimic in the bathroom. 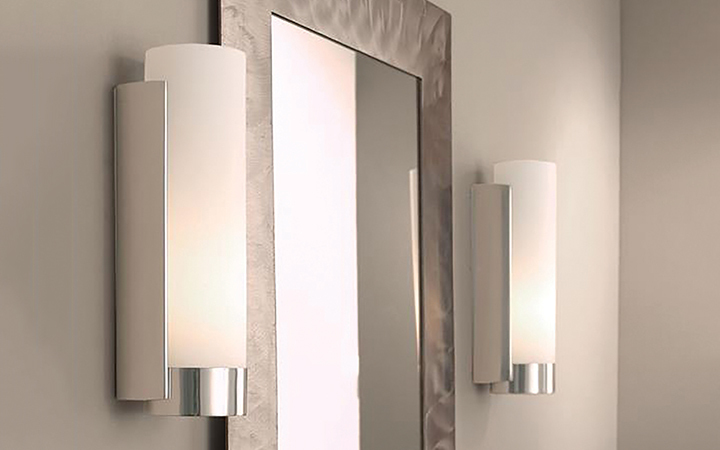 First, go for bathroom lighting fixtures with white shades—frost, clear or otherwise. Incandescent bulbs: These bulbs should have a “white” color indicated (warm white or cool white) or have a color temperature is between 2700K and 3000K. Compact Fluorescent bulbs: Contrary to popular belief, CFL bulbs can be a good choice for bathrooms—as long as their Color Rendering Index (CRI) is 90 or above. This indicates that they are close to displaying colors the way that daylight does. The ideal color temperature for CFLs is also between 2700K and 3000K. LEDs: Light-emitting diode (LED) bulbs have become viable options for bathroom lighting. Like the others, a CRI of 90 or above and color temperature of 2700K to 3000K are recommended. Pay close attention to the brightness for LEDs, indicated in lumens. See our guide on measuring lumens for more on picking the just-right bulb for the light you want to achieve. Bathrooms need to move from bright light for morning rituals to a soft mood light if you’re taking a soak in the tub. Luckily, there are several creative ways to easily move from one atmosphere to another. For example, install a dimmer switch to control the intensity of your vanity lights. These days, there are dimmers available for incandescent, fluorescent and LED lighting (we especially love the contemporary dimming controls from Legrand Adorne). If you have the space, choose a decorative fixture for your ceiling light. Small chandeliers and semi-flush ceiling lights can set a relaxed and romantic mood when the other bathroom lights are turned off. You could even add a small portable lamp if there’s extra room on your bathroom counter. A brighter bath means brighter days—these three guidelines will help you create a space you want to start each day in.